Hi. 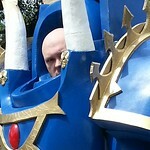 I've recently started a tech priest costume for some events in the next couple of months. So far the robe is almost finished but the augmentations still need a lot of work, I haven't even started the mask yet. The 'swiss knifey arm' is made from a thick cardboard roll that I rescued from a skip and reinforced with 2-part resin, so far it only has a gripper, green glowing syringe, and the core of a lightsaber flashlight, but there are mounting points for up to 16 tools around the central arm cannon. good start! Nice use of found materials. Ooh. Looking forward to seeing how this build progresses. Thanks for the replies. Progress is happening slowly but surely. The Adeptus Mechanicus logo for the battery box is printed and just needs painting and sticking on. I'm not sure if it needs the usual contrasting backplate or if I can save weight by just keeping it as is... wouldn't want to make the logo heretical. Anyway, the box should be able to mount to the rigging I've got under the robe and act as a central connection point for any gadgets that are added later. I already have a small solar panel and charge controller to mount on the top. Next up is the cutting disk. This still needs something that stops the arm when it reaches the extended position, and maybe a slightly bigger disk. The arm motor is from a robosapien, same as the gripper fingers. The disk motor is from a cd drive. As for the logo, I say unless you need to put it on a back-plate for structural reasons leave it off. looking good keep t up! I'm going to try to get the basics of this costume done by this weekend, but for now the logo is just about finished. The model I used for this is by con-f-use on Thingiverse. I used a base coat of black and white acrylic, with silver rub-n-buff and tea to add some wear. The silver eye was spraypainted through a rolled up tube, then the whole skull section was given a coat of clear sealer to make it waterproof. There goes the 2nd target date for completing this, but progress is still in... progress. For the backpack power supply, I drilled and bolted a waterproof enclosure to some old armour. I had planned to wear the armour inside the robe with the pack outside, but now I'm wondering if it would be better to paint the armour and keep it on the outside. The weight of the battery tends to pull the back plate down quite a bit, and it might need some decoration behind the transparent panel, but otherwise I'm quite happy with how it's turned out. It should provide a usefull mounting point for other augmentations later on. The arm is a little less complete, and there's a problem that I'm not sure how best to solve. The main gadget on this is the gripper tool, which is a simple pair of geared motors with a pincer on each. The problem is, this is mounted on the end of a telescoping pole that can extend to double or triple it's length, but still needs to be wired into the driver board at the back of the arm. If I just use a long cable, it'll hang down when the gripper is retracted causing a trip hazard. I'll look for a coiled wire, but if anyone has any other suggestions they would be appreciated.